This Fennel Avocado Chickpea Salad contains the best of everything. Essential Fatty Acids in the form of hemp oil, tahini and avocado. High-quality protein the form of quinoa and chickpeas and an alkalinity boost from the fennel, lemon, red cabbage, raw coconut vinegar, fresh mint, parsley and alfalfa. I love using Raw Coconut Vinegar in my salads. It supposedly has even more healing effects than raw apple cider vinegar as it is rich in vitamins, minerals, and amino acids. The naturally occurring acids found in raw coconut provide the body with essential minerals such as potassium, calcium, sodium and magnesium. Minerals such as potassium, calcium, sodium and magnesium help balance the body. An acidic pH balance is at the root of many diseases. It causes your body to burn energy less efficiently, causing toxic waste and inflammation. That’s why eating a plant-based meal with plenty alkalizing foods is so important for your health, especially of your diet includes acidifying foods like meat, dairy and grains and almost all processed foods. 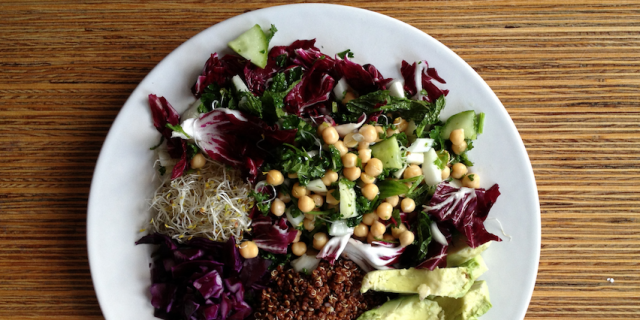 Mix all salad ingredients in a salad bowl, sprinkle the dressing on top and enjoy your Fennel Avocado Chickpea Salad!